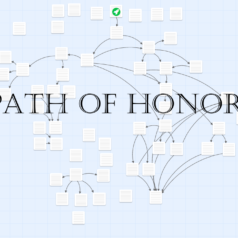 Path of Honors (here at my Twine site on philome.la) is an experimental interactive history that I am designing in bits and pieces. The plan is to model an aristocratic Roman as he played the game of politics and sought to win election to offices and gain prestige and dignity for himself and his family. PoH is skeletal right now and will likely take years to finish. In the meantime I hope it will provoke conversation and suggest what historians could do with the interactive medium of choice-based texts. Lucas Coyne, a doctoral student in U.S. History at Loyola University in Chicago, sent me a list of terrific questions about Path of Honors (play here). Their depth and breadth encouraged me to write and post the answers as pieces on PlaythePast. For question 1-3, see this essay. Here is question #4: I’ll answer more soon. I‘ve spent a lot of time thinking about your question and coming up with different responses and false starts because asking what choices were available to a historical agent is at the heart of counterfactual history and the very issue of agency/free will in humans (the latter I have been teaching in a philosophy elective this season, which makes me less certain than normal about such things). Some other time, hopefully we can explore those issues. In the meantime, I’ll focus on PoH and choice in PoH, since that’s what inspired my comment. A choice-based medium like a Twine interactive history seems to encourage creating at least some counterfactual history–indeed it would appear exceedingly difficult to avoid some counterfactual history in such a text so long as the player has choices in how the text branches. But on top of that, the conventions of choice-based interactive texts suggest, if turned to the creation of interactive history, a portrayal of the past where the different choices the player makes are primarily what causes different historical outcomes. And such interactive texts would, if we follow the general conventions of the medium, tend to portray the authentic past and alternative possible pasts as the result of different choices instead of just the pure contingency of physical phenomena oblivious to physical choices (Columbus’ ships all sank in the Atlantic, the blast of that bomb that was meant to kill Hitler penetrated the oak table and killed him, Harold of England did not get an arrow in the eye; Marie Curie did not succumb to radiation poisoning). Certainly, these kinds of counterfactuals events and effects can make for interesting alternative narratives, but they are perhaps a less intuitive design in a choice-based medium like Twine. Removed from the role of a historical agent, the player could be an experimenter of sorts pulling different levers to see the results. That, by the way, is a perfectly legitimate idea for a choice based game and it’s one that is explored by Max Kreminski’s Epitaph https://mkremins.github.io/epitaph/ where the player chooses what technologies to introduce to a civilization and the game world changes in response (a caveat: I have not investigated how simulation-y the model in the game is, or even if there is a world model per se, but the game illustrates the player role I am talking about). But PoH is intended to give the player a historical role and historically authentic choices in how to fulfill that role. So, with PoH I have started with the assumption that agents in this political competition for offices and honors in the Republic made choices, and those choices influenced outcomes. This led me to a design problem and historical question rather quickly when designing the section on the military service required of office holders. I took it as a given that player characters would have to fulfill ten years of military service before holding public office, as required by Roman convention. Now, there is no question that having a reputation for virtus, essentially “martial manliness”, was helpful, perhaps critical, in the success of aristocrats as they climbed the political ladder. That itself raised the issue. What options were open to agents (and players) within the framework of ten years of military service? What would be a reasonable representation of historically available choice? What does the medium allow? Some options are not really options in an interactive text. Players cannot really engage in a skill-based military contest of the type modeled in graphical first-person perspective games; the text-based medium will not really allow for that. They might be able to engage in RPG-style combat, but I worry that that would lead to an unrealistic model that might undermine the historical authenticity of the text. Such a choice violates the rule of meaningful choices in game design. Why would anyone pick option 2 unless they were deliberately trying to make their character not succeed? Option 1 is the obvious choice. But if it is the obvious choice then, to some extent, I will have suggested that historical agents really had no choice at all in this matter, only one viable option. That seemed unsatisfying, though again we are butting up against thorny issues of free will, agency, and causation. So, I had to reflect a bit more on what historical considerations might have dissuaded an agent from the first choice. To put it another way, why might a historical agent have selected the second option as more viable? Ultimately, I concluded that military service from the perspective of the rising aristocrat could be seen as a risk-management exercise. Heroic deeds increased the chance of acquiring distinction for virtus but also made it more likely to get killed. Competent but unheroic service would lessen the chance of death, but also lessen the likelihood of earning distinction for virtus. Now I had a historically authentic choice that gave the player two viable options and no categorically superior choice — not unlike life. An positive side effect, reported to me by some early players is that the risk of death seemed insignificant at first, but as the character acquired a reputation for virtus and got closer to completing the required ten years of military service, choosing the risk-taking course was more difficult. That idea of risk-management carried over into my first pass at legal advocacy, another means of gaining influence as a young aristocrat. I am still working out details for a slightly more elaborate system there. present a historical agent as living a life forwards rather than viewing it solely through 20/20 hindsight. it will at the very least fail to engage if the player only ever meets with two choices: an appealing/good/effective choice and an unappealing/silly/ineffectual choice. It may also fail in the objectives above (which, of course, are subjective) suggesting that, effectively, the agent had only one viable option, which just goes back to portraying history as pre-determined. That seems to be the the very thing that one might presumably use Twine to circumvent. As far as whether counterfactuals can be avoided, I think the very nature of Twine, to produce branching narratives, implores one to explore counterfactuals and provides a powerful means for doing so. I say “implores,” because one could surely write a historical Twine where the player decided what to focus on at a particular moment, who to listen to, etc. but could do nothing that changed anything in the historical record. But I think that’s missing the value of Twine and counterfactual history and what they can do for each other. Thank you for opposing the notion that history is somehow predetermined. I still remember reading a historical gamebook for younger readers where picking what seemed like the honorable, stay-the-course path led to an early death because *that’s not what the protagonist had done in real life*. Which I suppose is fine for a game(book) intended to test a student’s knowledge of real history — in retrospect, that might have been the intention — but at the time it baffled and disappointed me. Was I not being given enough tests in school, with fixed predetermined answers I had to reproduce just so in order to pass? Games can do much better than that, and they should. Thanks for the comment, Felix and for posting a couple of cross links to my work. There are some historians who would go so far as to suggest that learning a counterfactual account in a game does not teach anything about actual history. But that to me suggests that then history is nothing other than a fixed narrative. And if it’s fixed and there were no choices available, I fail to see the reason for studying it all. To me the real question is what systems influenced certain kinds of behaviors or other. Games delve into that perfectly. I also agree completely that teaching history as a set of established questions, facts, and answers determined by some experts and imposed on students is not a very helpful/appealing way to view history — I argued that back when I wrote Gaming the Past and try to practice what I preach when I teach my own students.